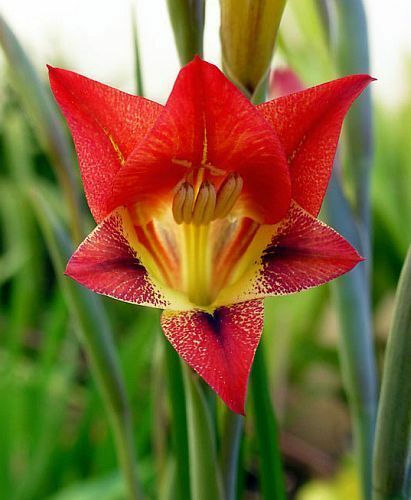 ﻿Gladiolus huttonii is a wunderful plant with magnificant deep red flowers. The genus name Gladiolus is derived from the Latin gladiolus, meaning a small sword, and refers to the narrow, sword-shaped leaves produced by many Gladiolus species. Gladiolus huttonii need a well-ventilated, sunny aspect, preferably receiving full morning sun and afternoon shade. Fresh seeds germinate readily within four to five weeks.